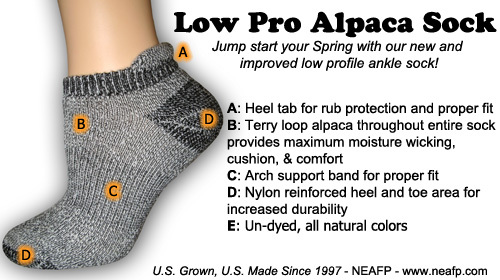 Jump start your Spring with our new and improved Low Pro Alpaca Sock. 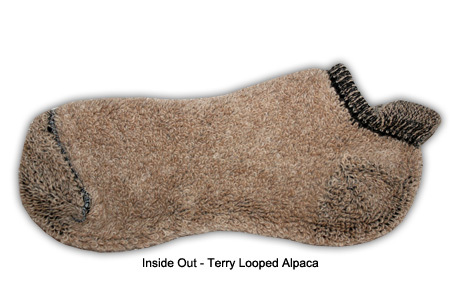 This low profile design has alpaca terry loops through the entire sock for cushion, comfort, and maximum moisture wicking. There is a heel tab to keep the sock in place and prevent rubbing. The arch band wraps around the entire sock for a proper fit and the heel and toe have been reinforced with nylon for increased durability. Hypo-allergenic, un-dyed, and naturally odor resistant.